Over the last couple of years, I have been observing with concern the decreasing size of flats on the Pune real estate market. Of course, it is the demand for smaller flats that is driving this kind of supply. With housing prices in the Pune Municipal Corporation rising relentlessly, the ‘biggest’ opportunity that developers perceive is in smaller flats that get sold in the shortest possible time. This kind of supply is aimed at first-time home buyers who either have limited budgets or low financial confidence. Though these are supposed to be ‘affordable homes’, the pricing of these units is actually on the higher side. They sell because the prices are still lower than those of larger flats, but the buyers are actually paying an excessive unit cost. The reason for this disparity is that the ‘pigeon holes’ housing model itself has some inherent flaws built into it. To begin with, the share of common area that needs to allocated in a project that consists of only of small-sized homes means that the project loses in terms of overall efficiency and sale-able area. This results in lower revenue potential, so developers bump up their prices to compensate. Secondly, the cost of construction depends on the quantity of raw materials being used. When a developer is building a project which comprises exclusively of small units, his development costs actually go up because every unit needs to be provided with separate fittings, appliances and finishes. As a result, he will increase his prices to make up for the loss in profitability. Home buyers should be aware that the converse is equally true. In a project with larger units, developers save on costs because of more efficient common space utilization and lower consumption of fittings, appliances and finishes for individual units. This is why a 1 BHK is often only 30-35% less expensive than a 2 BHK. The bottom line is that by opting for larger flats, property buyers are getting more value for their money. Also, projects comprising of larger flats tend to have better common amenities, which the developer can maximize the overall livability and therefore attractiveness of the project rather than needing to focus on making as many units as possible within the available space. The obvious question that follows is – where can middle class home buyers from Pune find larger flats that fall within their budgets? The answer is – in the developing (rather than expensive over-developed) parts of the city. For example, West Pune is a corridor where hundreds of property buyers are still able to find true value for their money. Property rates in many of the the areas of PCMC are lower than the inner localitions of the Pune Municipal Corporation, which means that buyers can get the benefits of larger flats with better amenities there. With the vastly improved road connectivity, the newer areas of West Pune close to Hinjewadi and the MIDC are now becoming the destinations most favoured by home buyers working in these employment catchments. While real estate is a constantly changing and evolving concept, some parameters remain constant – the three success mantras are still Location, Location and Location. In this respect, Western Pune is an important new chapter in the annals of Pune real estate’s success story. One of the most exciting new locations in this corridor is Punawale. Thanks to massive demand for residential and commercial properties, Western Pune has delivered some of Pune’s hottest real estate locations over the past decade. Punawale is the latest addition to the region’s lineup of strategic real estate development and investment hotspots. Located advantageously close to Hinjewadi and its burgeoning IT Park and the Pune-Mumbai Expressway, Punawale has now emerged as the location of choice for home buyers from the Information Technology as well as manufacturing segments. Punawale is also in close proximity to Wakad and benefits from convenient access to various hospitals, schools and shopping malls. Like Moshi, Ravet, Spine Road, Wakad and many other highly successful real estate locations, Punawale has the added advantage of being located at the fulcrum of various mega road development projects by this region’s infrastructure-focused town planning authorities. Backed by the unlimited cash reserves at the disposal of Asia’s wealthiest Municipal Corporation. Backed by a diverse and vibrant economy which provides a convincing complement to that of Pune, real estate growth in Western Pune is backed by a prolific manufacturing sector represented by a number of national and global industry giants. This region is seeing a steady and growing pipeline of employment opportunities generated by its manufacturing and Information Technology industries. This factor has ensured that areas like Punawale see instant absorption of housing projects across budget brackets. It goes without saying that an employment-driven real estate location like Punawale also receives significant attention from property investors. In Punawale, Western Pune has received yet another iconic location to take this prosperous, infrastructure-driven region’s real estate story to the next level. The launch of Puneville, the game-changing, futuristic luxury township by Pharande Spaces at Punawale on India’s 68th Independence Day drew massive attendance of eminent dignitaries and real estate industry stakeholders. After hoisting the tricolour was hoisted at the launch venue to the refrains of the national anthem, Hemant Naiknavare – President, CREDAI Pune addressed the gathering and was generous in his praise for Puneville’s never-seen-before features. After the inaugural address, Kamlakar Akode, Director – Town Planning (Maharashtra) elaborated on the progressive ‘infrastructure first’ approach that is the hallmark of real estate planning and development in Pune’s progressive PCMC region, and added that Puneville is a fitting tribute to this futuristic approach which has set a new benchmark for Indian real estate. Addressing the gathering, Satish Magar, Vice President – CREDAI expressed his amazement at the world-class amenities offered at Puneville and also described the location at Punawale as nothing short of perfect. Shantilal Kataria, Vice President – CREDAI Maharashtra added that Punawale, Wakad and Hinjewadi are the most promising of Pune’s upcoming real estate locations and that Puneville is indeed an integrated township that has achieved global standards of excellence. Anil Pharande, Chairman – Pharande Spaces described Puneville as his personal labour of love and the culmination of Pharande Spaces’ constant quest towards perfection in integrated township development. He was also graphic in his praise for Aedas for bringing the full benefit of their global architectural design expertise to bear in this luxury township. After the Independence Day ceremony, Akash Pharande, Head (Marketing & Sales), Pharande Spaces treated the attending dignitaries and guests to an enthralling project presentation and a guided tour of Puneville and its various state-of-the art features. The sumptuous lunch that followed featured an international cuisine that dovetailed perfectly with Puneville’s uncompromisingly global design and ethos. On the occasion of Independence Day, PCMC’s pre-eminent residential township developers Pharande Spaces launched the luxury township Puneville at Punavale today. Puneville has been designed by Aedas, the globally acclaimed, award-winning architects of ultra-luxury hotels in Las Vegas and Macau, Shanghai’s dazzling Financial Centre and Singapore’s world-renowned Marina Bay Sands. In all respects, Puneville is a creation of pure marvel of luxurious extravagance, offering its residents an ultra-modern lifestyle in the midst of dazzling, futuristic architectural grandeur. 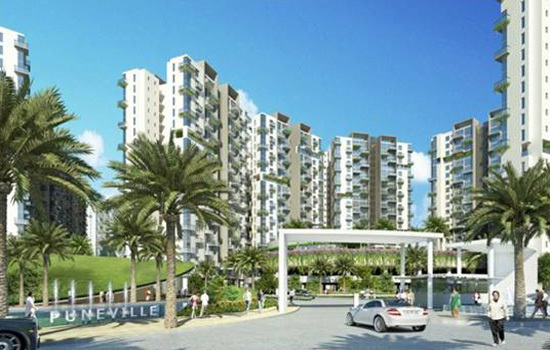 Puneville was conceived and created to be Pune’s ultimate showpiece of residential luxury. A celebration of cutting-edge architecture, the project is uniquely futuristic in all aspects. From the breath-taking 22 foot-high walkway that connects all of this township’s residential towers to the central common amenities to the clean, sweeping chrome and glass façades of the main promenade and the towers themselves, Puneville leaves no stone unturned in living up to the highest standards of Futuristic Living. A cohesive masterpiece of everything that spells ultra-modern urban living, this is in fact Pune’s first and only contemporary residential township featuring the innovative style of project design known as Futuristic Architecture. First seen in Italy in the early parts of the 20th Century, Futuristic Architecture’s primary characteristics are a strong accent on sweeping, dynamic lines, generous use of steel and chrome and overall style suggesting speed, flow, motion and rhythm. In Puneville, Pharande Spaces has given the city a township that embodies a glamorous Space Age lifestyle. A fully integrated and self-sufficient luxury township, Puneville features a state-of-the-art hospital, first-class international school and high-end commercial office complexes for corporate occupiers. Also included in the dazzling array of luxury offerings are an Olympic-size lagoon shape swimming pool, a clubhouse with the latest features and equipment, a fine dining restaurant, spectacularly landscaped gardens, a tennis court, verdant lawns, a jogger’s track, a fully-facilitated play area for children and serene, spacious water bodies. As the ultimate statement in modern living, the master design of this amazing luxury township is also Pune’s definitive destination for the Green Life. Conceived to comply with international specifications of sustainable real estate, Puneville is not only 100% environmental sustainable but also in complete environmental harmony with its surroundings. The township has been given a 4-Star pre-certification from GRIHA – one of the leading sustainability rating agencies in the country. Pharande Spaces, the leading real estate development company in the Pimpri-Chinchwad Municipal Corporation, today announced the launch of three new towers at its highly successful luxury township L-axis. The announcement was made at a glittering ceremony that was attended by world-renowned architect and town planning expert Prof. Christopher Benninger, architect Mrs. Usha Rangarajan and Ravi Varma, Vice Chairman of the National Association of Realtors. L-axis, one of the most successful township projects in the PCMC, has made a resounding market statement as the address of choice for HNIs from the PCMC, Pune and beyond. The location of this township has been one of the main catalysts for its success. In a relatively short period after its inception, Spine Road in the Pradhikaran region of Pune’s thriving twin city PCMC has become one of the most talked-about investment locations. The 22-kilometer long and 45 meter-wide Spine Road connects to all sectors in the PCMC and the areas along it have become key development hotspots in the region. Demand for homes in this area began peaking when the PCMC began further widening of this key transit infrastructure project. The Pradhikaran region, also known as Sector 42, encompasses a total area of 15000 acres and is a text-book case of planned development by the Pimpri Chinchwad New Town Development Authority PCNTDA. Because of the Pimpri-Chinchwad Municipal Corporation’s forward-looking approach to infrastructure, the PCMC has always been the forerunner of highly planned infrastructure-driven real estate development in the Pune region. The impeccable town planning employed in the PCMC has ensured that there is a full-fledged district centre for commercial development and activity. This approach has provided a uniform spread of well-paid employment opportunities over the entire region. L-axis is located in Sector 6, directly opposite the Bhosari District Centre with its high-profile corporate and government office complexes as well as a 5-star hotel and the recently launched ‘City One’ – PCMC’s first full-fledged shopping mall. The prestigious International Convention Centre is under construction in the immediate vicinity. Pharande Spaces has already distinguished itself delivering high quality township projects such as Woodsville in Moshi, Celestial City at Ravet and more recently Puneville at Punavale in this prosperous and progressive region. 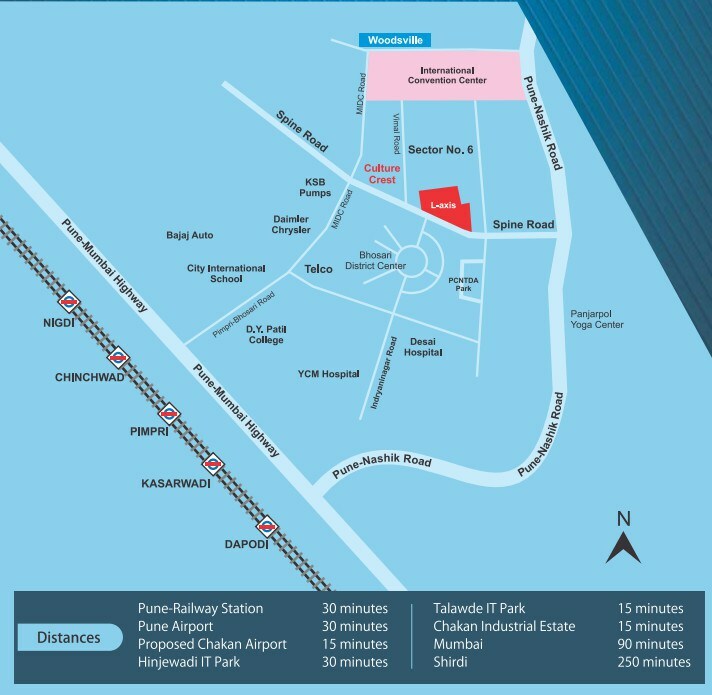 Launched in 2012, L-axis was conceived in response to the huge demand for luxury apartments in pune emanating from top management home buyers of the region’s many manufacturing giants, the Chakan industrial area and international automobile companies like Volkswagen, Mercedes Benz and Mahindra & Mahindra and General Motors. Pharande Spaces launched the two new towers at L-axis in the presence of a 300+ gathering of channel partners and prominent real estate personalities. In the course of the evening, the company made a strong case for the unprecedented market proposition of this unique luxury township. The event was followed by a celebrity performance. What is it about Pimpri Chinchwad and its township properties that is so different from what is happening in the rest of the Pune property market? To understand this, one has to first understand what goes into the formation of a planned city. The immaculately planned residential areas that now define the Pimpri Chinchwad Municipal Corporation map are not an accident. They are the result of carefully planned social, economic and real estate growth. Unlike the central areas of Pune, the real estate market in PCMC has been scrupulously shielded from the PMC’s ad hoc development style. The vigilance and futuristic thinking that went into this avant-garde satellite city have added a completely new dimension to the concept of residential properties in Pune. From the very outset, the PCMC planning authorities were determined to avoid the mistakes committed in nearby Navi Mumbai, popularly known as the world’s largest planned township. After all, what began as regulated development in Navi Mumbai soon began giving way to commercialised expansion. Instead, PCMC adopted a blueprint for smart growth – a blueprint that placed utmost importance to organized urban planning. No scope was given to a nearsighted focus on capitalization on this new area’s development potential – the onus was firmly kept on long-term considerations. This was to be the city of the future – a place where residents could work, live and relax without any of the constraints that plague the rest of Pune. Slowly, almost imperceptibly, the landscape of this previously ignored satellite city changed. Proposals for faster development were turned down. The master plan stayed in place, and the results are now brilliantly evident. Today, Pimpri Chinchwad Municipal Corporation is an acknowledged masterpiece of community-oriented real estate development. 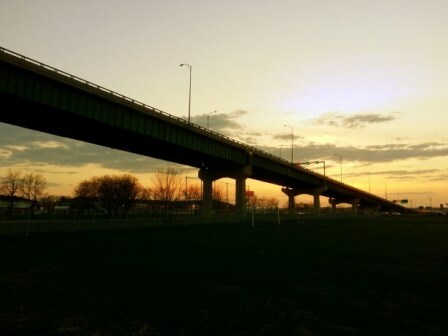 It has a unique blend of sustainable residential spaces, highly advanced transportation networks, a broad spectrum of employment opportunities, modern housing typologies such as township properties and superior supportive infrastructure. At every stage of planning, this city’s inherent natural, cultural, sociological and economic resources have been carefully preserved. This incredible growth area is now the most logical option for residential property in Pune today. For home buyers, PCMC is the perfect alternative to Pune’s unregulated urban sprawl, rapidly compounding traffic congestion and disconnected neighbourhoods. Considering the increasing evidence if rapid urban decay in central Pune, township properties such as those now coming up in Pimpri Chinchwad Municipal Corporation are the truly the New Residential Deal. However, PCMC is not only about wider, greener spaces, cheaper property rates, improved social fabric and better infrastructure. The establishment of such new growth areas, with modern residential alternatives such as integrated townships, is a blessing to the Pune real estate market (which has been stagnating within increasingly larger pockets). At first sight, they only seem to play a role in reducing the urban sprawl and offering home buyers a healthier and more comfortable lifestyle. These township projects are also instrumental in creating new urban centres, wherein new business districts create job growth in new directions. Thanks to the organized nature of their development, they create new and more rational scope for real estate market expansion while reducing pressure on property prices in the parent city. 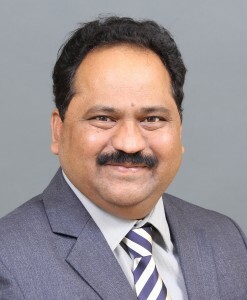 Anil Pharande is Chairman of Pharande Spaces, a leading construction and development firm operating in the PCMC area of Pune, India. The Pune residential real estate boom, initially kick-started by the IT/ITeS industry, has brought about a lot of unregulated development. While property prices in Pune rose unrealistically, the city’s traditional ease of living and pleasant climate, which were previously its USPs, suffered. Hills and trees have been razed to accommodate the rapidly expanding concrete jungle that all but defines central Pune today. The town planning commission found itself impotent in the face of the development mania, which soon transcended all reasonable, sustainable boundaries. In Pune, infrastructure challenges have been increasing because of the ever-increasing population. This has also put escalating pressure on available land, resulting in the forced extension of the city limits. The pattern of development has been decidedly mercenary and unplanned, with the only criteria being accessibility to existing and upcoming IT hubs. While the rise of Hinjewadi created increasing demand for homes in its immediate vicinity, places like Aundh soon witnessed a slew of projects by property developers. Similarly, property prices in Baner and Wakad rose so steeply that they finally corrected. As things stand now, central Pune no longer has an iota of its previous quality and ambience in residential property offerings. It is therefore not surprising that homebuyers are beginning to focus on the Pimpri-Chinchwad Municipal Corporation. This area has, in fact, emerged as the last outpost Pune’s previous residential property comfort levels. The Pimpri Chinchwad Municipal Corporation first came into the limelight as an industrial area. However, it also has an advantage that central Pune does not – planned development. The growth of the real estate sector in the Pimpri Chinchwad Municipal Corporation is closely regulated by the PCNTDA, which works together with the PCMC to ensure planned and realistic growth. Central Pune continues to suffer from pollution, depleting greenery, traffic jams, water and power scarcity, lack of proper infrastructure and unrealistic residential property rates. Meanwhile, Pradhikaran (the location that defines the PCNTDA) has been benefiting from sensible real estate development. If one studies the demographic development of Pune real estate growth, it is evident that Pradhikaran is precisely where the city’s growth is headed in the North/North-Western direction. This is extremely significant in terms of long-term residential property investment. In years gone by, the PCNTDA began to acquire land in the PCMC area so that planned development could take place in the future. This planning included the allocation of specific areas for industrial activity, residential property development, public parks, unobstructed spaces, shopping centres, office buildings, roads and utilities. Water supply to all sectors was ensured by the construction of several mammoth water tanks, each with capacities of several million litres, before development was permitted in each sector. Once this was done, the PCNTDA made the developed land parcels available to property developers. The PCMC master plan also provides for generous road widths, the likes of which are impossible elsewhere in Pune. This goes a long way in preserving one of Pradhikaran’s natural splendour and hygiene. Because of these factors, and also because of the growth in the PCMC industrial belt, the last two years have witnessed a huge increase in demand for residential property in the Pradhikaran area. The fact that a number of large international companies are operating in nearby Chakan has, in fact, been a primary criterion for the area’s development profile. These companies regularly deliver thousands of jobs at all levels, which has had a telling effect on Pradhikaran’s general economic status. Specifically, there has been a huge surge in demand for residential property there. 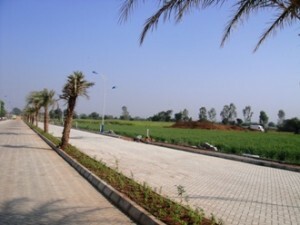 Pradhikaran’s expansion, which has been inspired by the Chandigarh model of controlled development, began with a few hundred acres. Today, the area speaks for about 7000 acres. Pradhikaran is continually seeing infrastructural enhancements on all fronts – including roads, water and electricity supply and digital connectivity. Pradhikaran now boasts of massive integrated township projects that offer all the hallmarks of ambient, sustainable living. Apart from the high lifestyle quotient, the investment potential of these townships benefits from a magic mix of real estate market drivers. The presence of Tata Motors, Talawade, Hinjewadi, Chakan and the Pimpri-Chinchwad industrial belt add to the value of these townships, while the Mumbai-Pune highway and Expressway make it advantageously accessible to the financial capital of Mumbai. No wonder that Pradhikaran is now being seen as both, the best option for first home buyers, and as the new residential property investment hotspot in Pune’s real estate market. PuneVille. An ultra-exclusive luxury residential township by Pharande Spaces at Punavale, the latest real estate investment hotspot in Pune’s burgeoning Pimpri-Chinchwad Municipal Corporation. The project will be constructed on a generous 40-acre plot and will offer every luxury and convenience of modern life to its residents. And this is not just a promise – it is a blueprinted guarantee. PuneVille has been conceived to stand head and shoulders above the rest – not just first among equals, but quite literally without peers. This unique luxury project has been conceived by Aedas, the global award-winning architects who have master-minded Venetian style-hotels in Las Vegas and Macau, as well as the Financial Centre in Shanghai and Marina Bay Sands at Singapore. Aedas ranks second among the world’s top architectural firms and will bring its full expertise to bear on PuneVille. Aedas is the leading international design firm which specializes in blending architecture, interior design, landscaping and overall project concepts into cohesive and stunningly compelling masterpieces. Thanks to Aedas, PuneVille is not only a marvel of modern architectural and lifestyle – it is actually based on this firm’s deep study of the location’s geographic, climatic and environmental profile. This has given rise to a luxury living community which is not only the ultimate statement in modern living, but also completely in harmony with its surrounding in every respect. PuneVille is a top-of-line luxury residential project. The first phase consists of 16 towers, each with 23 storeys of exclusive and uniquely crafted living spaces. The entire project has been designed with a luxury resort theme. Every unit is uniquely crafted, provided with the highest-quality imported fittings, fixtures and marble flooring as well the top Indian brands. PuneVille will incorporate an international school, a state-of-the-art hospital and well as high-end commercial office spaces. This township is going to be among of the best in the country and incorporate every conceivable luxury feature, including a Olympic-size lagoon shape swimming pool, Club House, restaurant, landscape garden, tennis / multi-use court, lush lawns, a Joggers Track, a children’s’ play area, a serene and spacious water bodies, and a walkway at a height of 22 feet, connecting all the residential towers to the central common amenities. Punavale is the perfect location for such a unique luxury offering. It is in the very heart of the Pimpri-Chinchwad Municipal Corporation, and just one kilometer from Wakad. Punavale provides easy access to Aundh, Baner the University Circle and Hinjewadi, home to Pune’s largest and most vibrant IT Park, as well as to Lonavala and Mumbai via the Expressway. In fact, PuneVille is a mere five minutes’ drive to the Pune-Mumbai Expressway via a specially constructed 700 meters access road. Likewise, Hinjewadi will be brought even closer via the proposed road which adjoins the project. Immediate access to the proposed 6-lane road to Baner will bring the Queen of The Suburbs, along with all its shopping complexes, hospitals and leisure outlets, within easy reach. On a macro level, the PCMC region is poised for a quantum upgrade in its economic profile, with in excess of 6000 new white collar jobs to be created over the next few years, 36 new educational institutes coming up and major hospitality giants such as Taj Gateway, JW Marriot, Smart Inn, Le Royale, Lemon Tree, St. Laurn and Sayaji delivering the final vitalizing boost. PuneVille will also be PCMC’s most outstanding statement from the perspective of environmental sustainability. The project has already been awarded a 4-Star pre-certification from GRIHA – one of the leading sustainability rating agencies in the country. With the rapidly increasing interest for ‘green living’ among Pune’s most discerning home buyers, we could do no less than ensure that PuneVille takes a leadership position on this front. In short, PuneVille will outshine anything so far seen in residential real estate in Pune – and indeed, the rest of the country. It is a tantalizing vision of a modern lifestyle transformed into magnificent reality. The very highest standard of urban living – now, or in the future…. Pimpri-Chinchwad Municipal Corporation, Pune’s thriving sister city, is all set to throw the doors of its first full-fledged mall open to the public. City One Mall is an undertaking by PCMC’s leading development group Pharande Spaces in partnership with Rama Group, and is being leased by out Jones Lang LaSalle India. PCMC has always been a promising catchment for retail developments. The region’s versatile population profile has already spelled success for major local category players like Jai-Hind, Ranka Jewellers, Silver Leaf, Krishna Rajaram Ashtekar, Vama, Hastakala Sarees, PNG, Bafna Jewellers and Chandukaka Saraf. Nevertheless, PCMC has not had the benefit of a full-fledged mall development to cater to its highly aspirational and rapidly growing shopper catchment. This region has seen a quantum leap in retail viability, driven by the high purchasing power of employees from its automobile and other manufacturing industries as well as massive trading community. The potential for organized retail in Pimpri-Chinchwad was waiting to be tapped. The demand for space at City One has been nothing short of spectacular. PCMC’s industrial development is the most important ingredient of its success story. The proximity of massive manufacturing clusters within its precincts has fueled job availability across literally all socio-economic strata. The region’s unmatched employment generation has, in turn, driven demand for residential properties from affordable housing to luxury homes. Even as more and more commercial and industrial establishments arrive to set up shop there, residential developers in the PCMC have their hands full delivering projects across the various price bands. So far, organized retail has had a very limited presence in the PCMC belt. The opportunity for retailers to capture the full potential of this market is much greater as compared to many other locations. The massive residential development happening in and around PCMC is creating considerable inherent retail demand. National hypermarket chains such as Big Bazaar, Star Bazaar and D Mart and organised retail chains like E Zone, Croma, Vijay Sales, McDonald, Just In Time, World of Titan, Tanishq and FabIndia already exist in stand-alone stores. Now, City One Mall at is all set to offer all the major brands under a single roof. City One Mall’s total development size is 3,33,000 square feet of built-up area, consisting of two buildings, both equipped with four levels of retail spaces and two levels of parking space. In the first building, which has a total area of 1,12,000 square feet, Central has already snapped up 81,000 square feet across the ground, first and second floors and is gearing up for a grand launch of Pimpri Central by the end of 2013. The remaining 21,000 square feet have been leased to Men’s Avenue – a leading Pune-based apparel retailer which has also taken up space for their ‘Kajree’ saree section on the second floor. Both these stores were inaugurated on 11th October, 2013 by Hon’ble Deputy Chief Minister of Maharashtra, Shri Ajit Pawar.